I grew up skiing. My parents shoved my tiny little toddler feet into hard plastic boots, locked them into ski bindings and pushed me down a hill for the first time when I was not yet three years old. Skiing seemed to encompass my childhood winters, swallowing up all the bitter cold, icy roads, and dark, early mornings and turning them all into just another part of a fantastic ski day. In the midnineties, when I was a still a little girl, my mother and father took a trip to Steamboat Springs, Colorado so they could ski, and my father could write an article for a local ski magazine about the resort. The ski magazine arranged some fun resort-y events for them, like a hot air balloon ride, and they had to try out some of the resort's restaurants to write about as well. 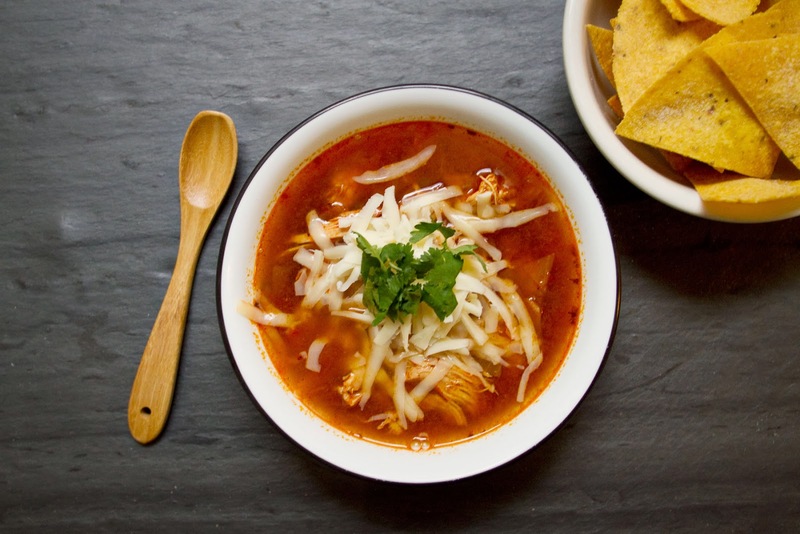 It was at one of the resort restaurants, La Montana Mexican Restaurant, that they discovered this Tortilla Soup. They both loved it. After they ate, my father was looking through the prints he had just gotten back from the trip so far (oh, the days of film photography! Holding actual prints in your hands! ), when the waiter came over and complimented one of his photographs. I believe it was of the hot air balloon before the ride, which is a rainbow striped bubble tethered to the ground in front of the grey and white behemoths of the mountains in the photos I have seen. The waiter asked my father if he could buy a copy of the photo from him, and my father thought about it. He had gotten doubles, after all. He told the kid sure, on one condition. 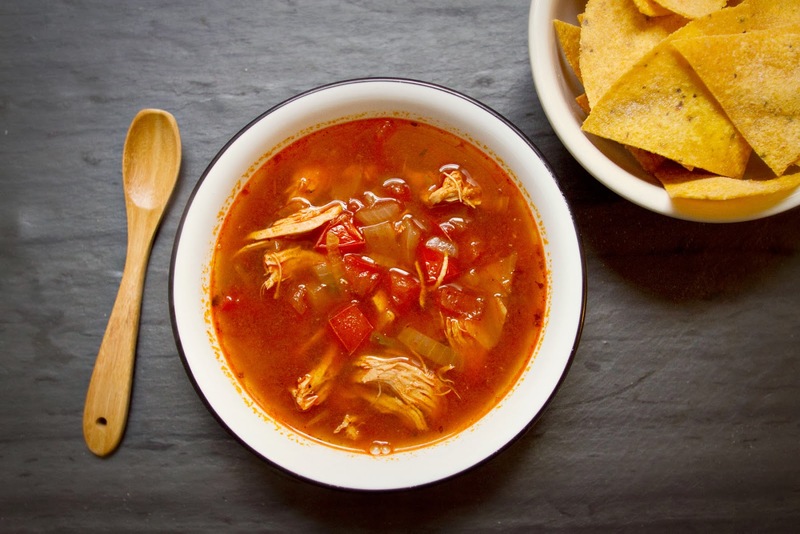 He wouldn't sell it to him, but he would trade it- for the Tortilla Soup recipe. The waiter scurried back into the kitchen and reappeared with the recipe a minute later, and the trade was on. 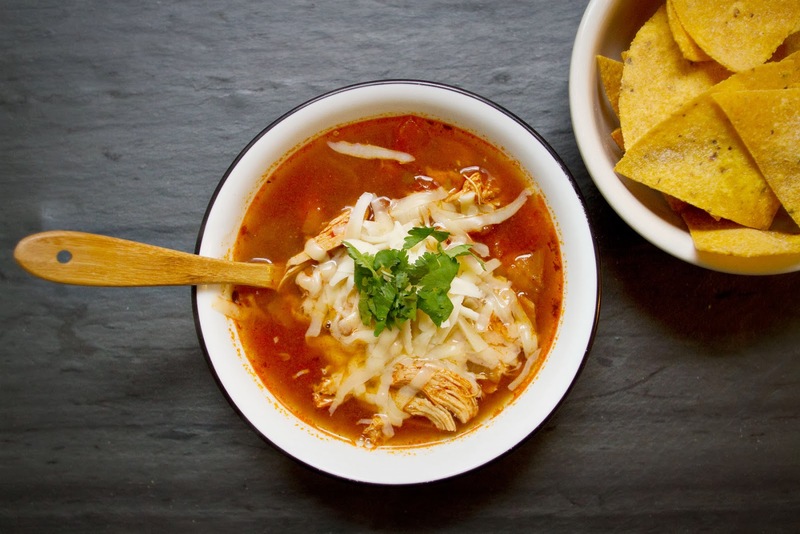 When they returned home my father tried the tortilla soup recipe out on my brother and me. My brother, Sean, was not impressed. Which is not surprising as the reason Sean has never featured in my food antics before is because he is so picky we practically disagree on all things food related. Except pizza. Everyone likes pizza. I, on the other hand, loved the soup immediately. 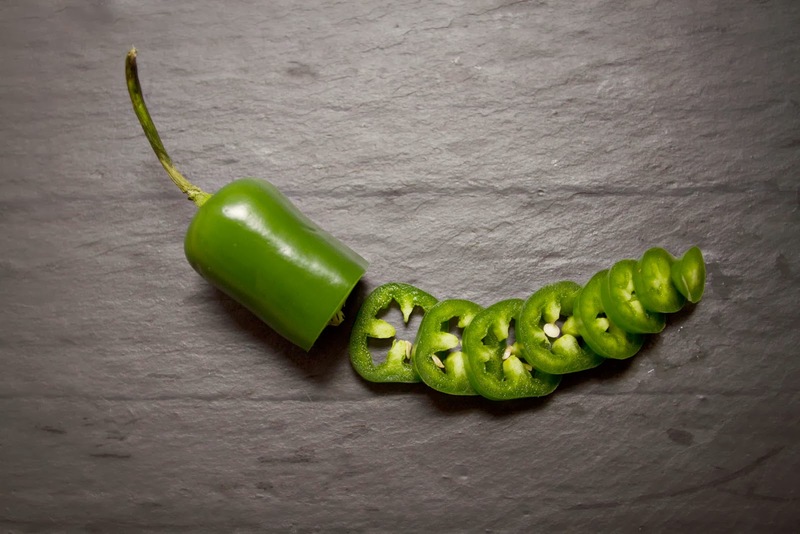 It was so spicy, and as I child I loved spicy foods. And it had goopy, stringy melted cheese, which was another thing I loved dearly. Not to mention fried onions as the base- still my favorite way to begin a soup. The spices are what really make it though, as soon as I pour the chili, cumin, and oregano into the pot of broth and veggies, the soup takes on a smell that practically transports me back to my childhood, squatting by the kitchen heater vent on a little blue plastic stool watching my parents prepare dinner. I have added chicken to the soup for this recipe, to make it more of a dinner on it's own, but it's delicious without too, if you would prefer. This was actually this first time I ever added chicken, but I love the way it turned out. The broth soaked into the chicken really well, and the bit of paprika on the chicken added another layer of spice to the overall flavor. I have been meaning to make this recipe for you for months, in fact I have had my father email me his copy of the recipe at least twice in the last year. Yet somehow, when I went to make the soup last week, I couldn't find his recipe anywhere. Not in my saved files on the computer, not in my gmail inbox, not in my facebook inbox. So I gave up and googled it, thinking my parents are probably not the only people to ever request the recipe. Luckily there were many copies of it online, apparently asking for the recipe to this soup is a popular past time of skiers in Steamboat. I made a few tweaks, in addition to adding the chicken, like adding extra onion, tomato, and jalapeno. The original recipe called for just 1/3 C of diced onion but lets be real, if I don't use the whole onion the day I cut it, I'm never going to remember to use the rest, so in went a whole diced onion, and the soup is definitely better for it. However, just like when I was a little girl- I think the goopy, stringy, melty cheese mingling with the spicy, tomato-y broth is the cherry on top of this spicy, soupy sunday. Preheat oven to 375. 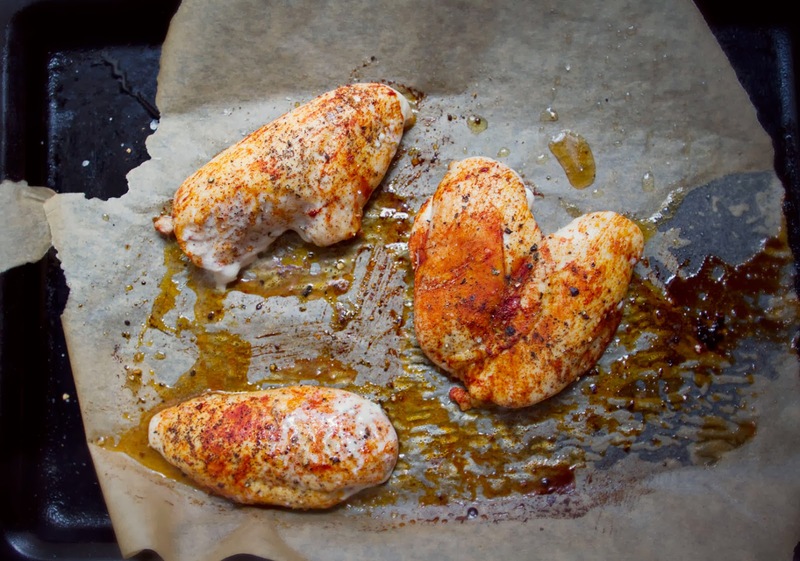 Place chicken breast on a lightly oiled pan, sprinkle with salt, pepper, and the 1 tsp hot paprika, and when oven is preheated bake chicken breast 15-20 minutes, until the juices run clear and chicken is cooked through. Shred with two forks and set aside. 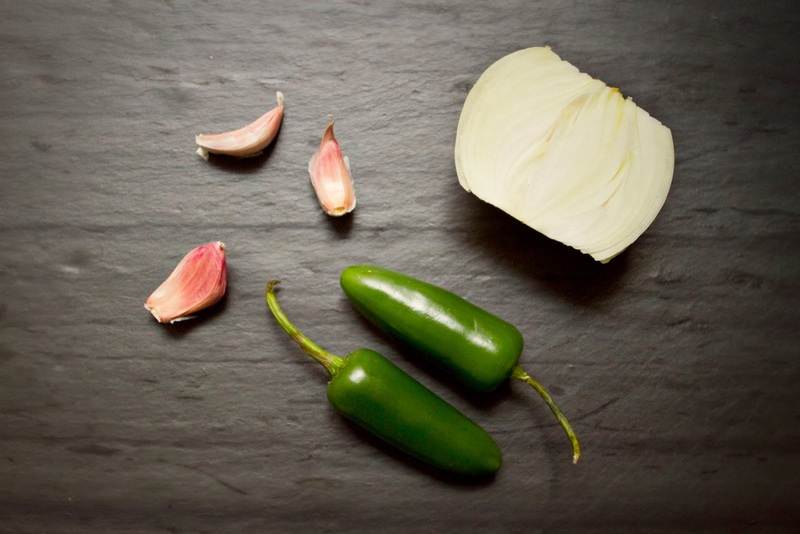 While chicken roasts, finely dice the onion, jalapeno, and garlic, pour the 2 tsp olive oil into a large soup pot, turn heat to medium-low and add the onions, garlic, and jalapenos. Cook until onions are transparent, and garlic is soft, about 5-7 minutes. Add the chicken stock in a few splashes, stirring well, to deglaze any onion bits that may have stuck to the pan. 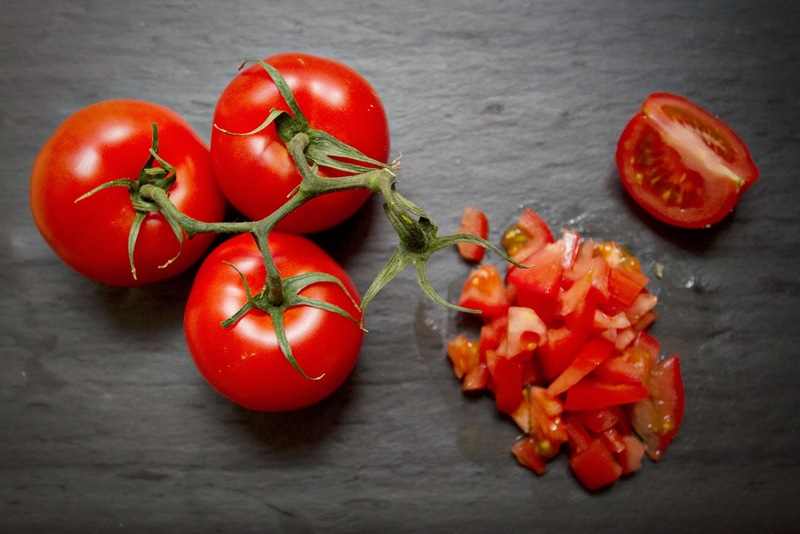 Add the tomatoes, tomato juice, chili powder, cumin, and oregano. 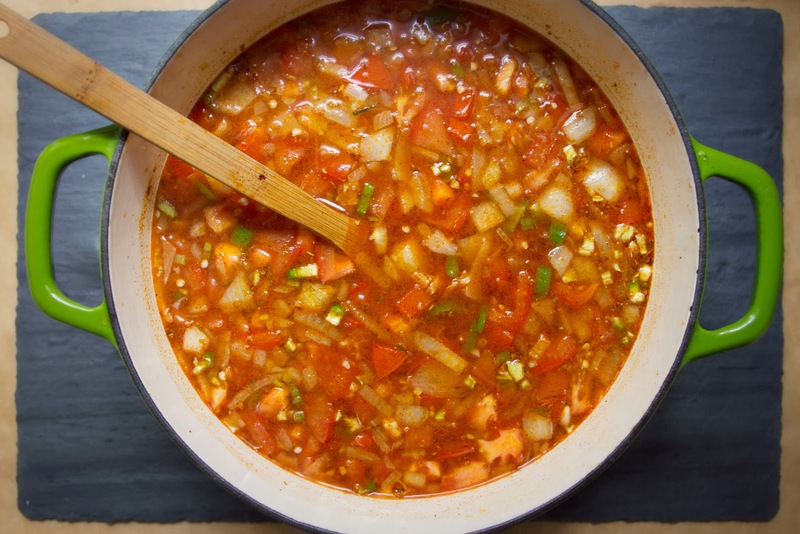 Bring the soup to a boil, then reduce to a simmer, add the shredded chicken, and cook for 30-45 minutes. Add 2 tsp of the chopped cilantro, simmer another 5 minutes. While soup is simmering cut the tortillas into chips. 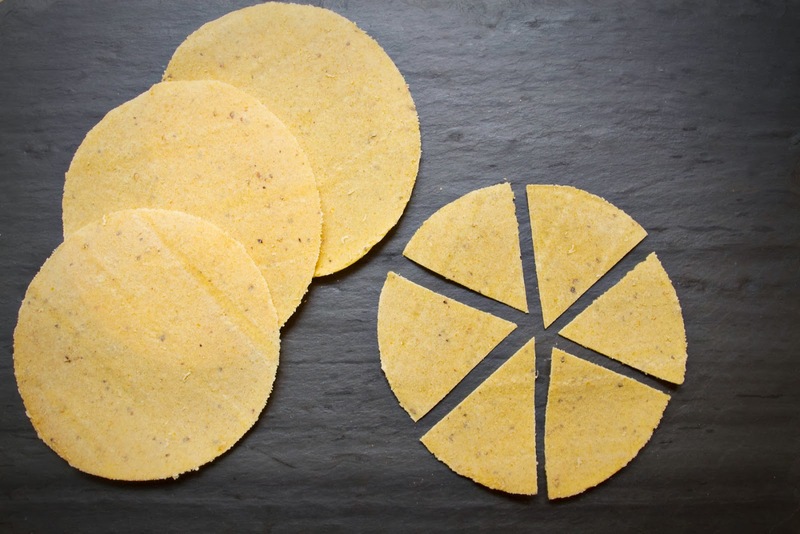 I cut mine in half, then cut each half into three triangles, producing 6 chips per tortilla. Heat about 1/4 inch of canola or other vegetable oil in a skillet over medium heat until the corner of a tortilla, when dipped in it, begins to fry quickly. 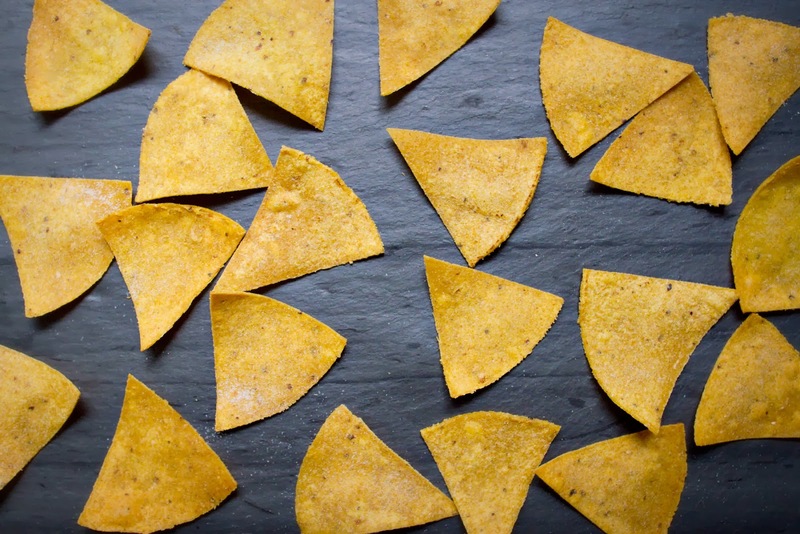 Test the heat by frying one triangle of tortilla first, it should take about 60-90 seconds to fully crisp up and lightly brown at the edges. 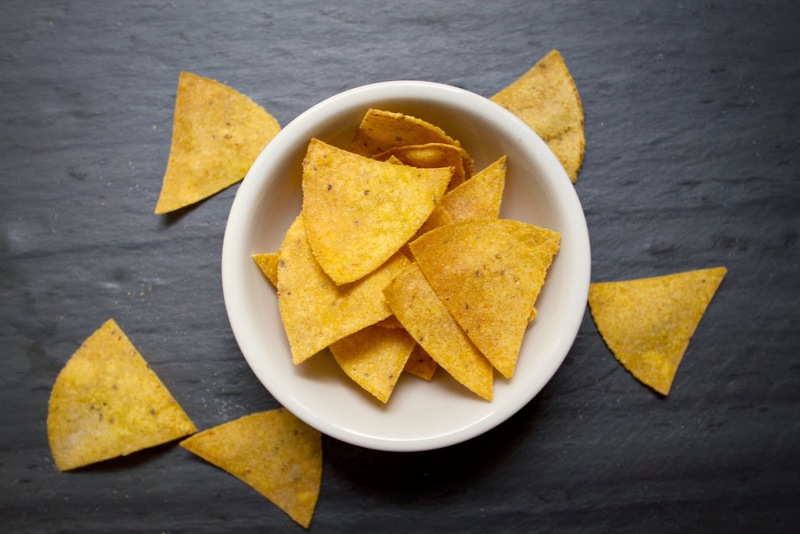 Cook the tortilla chips in batches, removing the finished chips with a slotted spoon and placing them on a plate lined in paper towels to absorb excess oil. Sprinkle the fresh chips with a bit of salt. 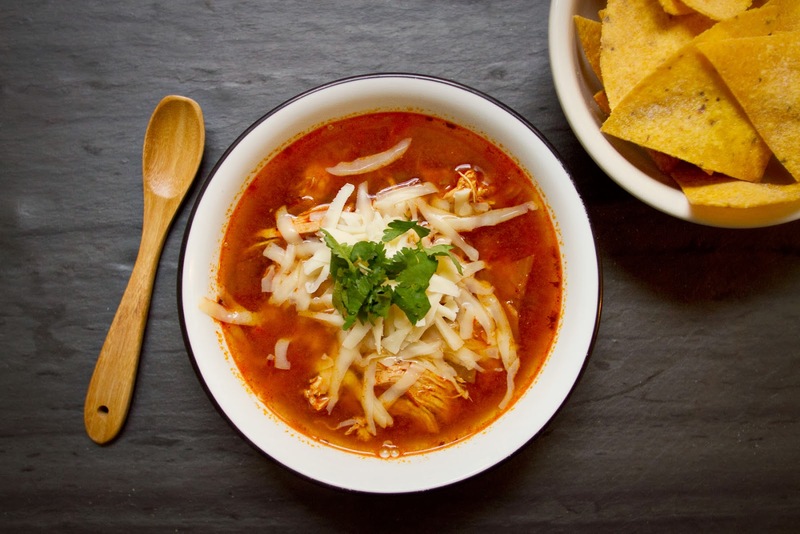 Serve soup in large bowls topped with grated Monterey Jack cheese, chopped cilantro, and tortilla chips. Enjoy! wow! This is great post.I like this post. Many many thanks for this post. I was not aware of this cooking method. I love the food at all difficult to handle temptation. Thank's for sharing. Loving all the flavours and spices going on in that dish marinade..